Adam has been digging out the well so we can attach new water lines and have running water. This is a very exciting prospect, as we have been bringing water in jugs for over a year now. And of course, as soon as he got the hole deep enough and started making it wider, it rained. Oh did it rain! An abundance of rain! I A glorious spring rain, gushing down off and on all day. It was the kind of April day that really makes you feel it’s springtime. The tulips and daffodills are up, everything is green, and everyone (but the cat) is content. When it rains here, we have what is called a wet weather creek. Yesterday it was 2 feet deep, and running fast. Today it is down to about 6 inches. 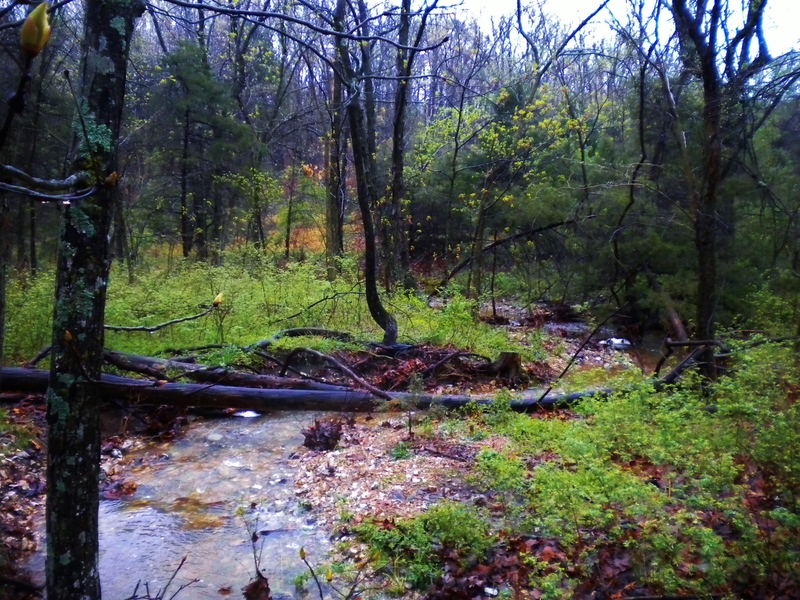 Because of the clay-and-rocks soil composition, water makes its way quickly downhill to the creek bed, running both over and under ground. In some places you can get your ankles wet standing in the grass. Of course, the hole filled with water. It only rained about 2 inches, I think, but the well is dug in a very good spot. Water is never far down it. And the hole filled from underneath all day. This afternoon, it was full up- 3 feet deep and still rising as the pile of dirt and clay around it slowly dried in the sun. So, I thought I would bail out the hole. I got a bucket and flung water as far as I could, so it wouldn’t just seep back in. After a few minutes, I slipped. Now, I had rolled up my work jeans and gone barefoot, but before I knew it, my ankles, hands and fundament were all smeared with wet red clay. I love squishing my bare feet in clay. Don’t you? So then I decided that it was an excellent time to make test balls of clay and clay-soil mix to see how hard it dries, and whether it cracks, and what color it turns out. This is an important part of building a house with cob. Honest. A little while later, having bailed much of the water out of the hole, and made various balls of dirt, and feeling a little like my 10-year-old self, I slogged over to the creek to rinse off. Creek water in April is cold. I can only imagine how crisp the well water will be when it gushes out of the spigot. Won’t be long now! Sounds like your 5 or 10 year old self to me, too! I will always remember when you came in and asked what jobs you could do where you got to dig in the dirt. “I like to dig in dirt!” you said. Sure hope you get running water soon. Love you and your dirt.